The Protection of the Mother of God is one of the most beloved feast days on the Orthodox Christian calendar among the Slavic Orthodox peoples, commemorated on October 1st. The holy feast is celebrated additionally on October 28th in the Greek Orthodox tradition. It is also known as the feast of the Virgin Mary's Cerement. In most Slavic languages the word "cerement" has a dual meaning of "veil" and "protection." The Greek skepi (Σκέπη), has a complex meaning. First of all, it refers to a cloak or shroud, but it also means protection or intercession. The feast day celebrates the appearance of the Mother of God (Theotokos) at Vlachernae in the 10then century. At the end of Saint Andrew of Constantinople's life, he, and his disciple Saint Epiphanius, and a group of Christians, saw the Mother of God, Saint John the Baptist, and several other Saints and Angels during a vigil in the Church of Vlachernae, near the city gates. The Vlachernae Palace church was where several of her relics were kept. The holy relics were her robe, veil, and part of her belt (zoni) that had been transferred from Palestine during the 5th century. In recent years, the Feast of the Holy Protection (Agia Skepi) has become associated with thanksgiving for the deliverance of the Greek Nation from the Italian invasion of 1940. These events are commemorated in Greece in a National Holiday know as "Oxi Day" or "No Day," referring to the response of the Prime Minister Metaxas to Mussolini's ultimatum. In recognition of this, and because of the many miracles of the Holy Ever-Virgin Mary which were reported by Greek soldiers during the Greco-Italian War of 1940-41, the Holy Synod of the Church of Greece elected in 1952 to transfer the Feast from October 1st to October 28th. The Ecumenical Patriarchate also provides for this usage in its parishes in Greece and in the Greek Diaspora, and it is generally observed now throughout the Greek-speaking world. 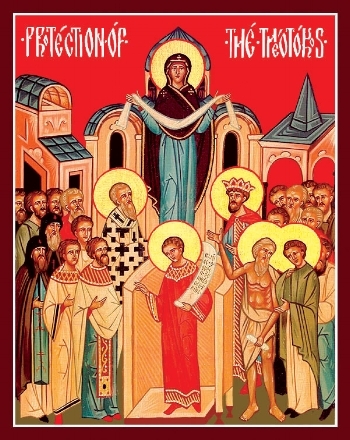 The observance includes the chanting of a Doxology incorporating hymns recognizing the Protection of the Theotokos over the Greek nation, as well the kontakion "O Champion Leader." Two different events that took place four hundred years apart are combined in this one holy icon. Both events took place in the former Church of Vlachernae in Constantinople. The holy icon of the Feast, Protection of the Mother of God, shows the Theotokos standing above the faithful with her arms outstretched in prayer and draped with a veil. On both sides of her are Angels. On the lower right of most holy icons of this feast, are Saints Andrew and his disciple Epiphanius who saw this vision of the Mother of God, with the Twelve Apostles, bishops, holy women, monks and martyrs, spreading her veil in protection over the congregation. Saint Epiphanius is wearing a tunic under his cloak and gestures in astonishment at the miraculous appearance, while Saint Andrew, Fool-for-Christ, is dressed only in a cloak. Below the Theotokos, in the center of the holy icon, stands a young man with a halo, he is clothed in a deacon's sticharion. In his left hand, he is holding an open scroll with the text of the Kontakion hymn for Nativity in honor of the Mother of God. This is Saint Romanos the Melodist, the famous hymnographer whose feast is also celebrated on the same, October 1st. He is with his choir attended by the Emperor Leo the Wise together with the Empress and the Patriarch of Constantinople. Today the faithful celebrate the feast with joy illumined by your coming, O Mother of God. Beholding your pure image we fervently cry to you: "Encompass us beneath the precious veil of your protection; deliver us from every form of evil by entreating Christ, your Son and Our God that He may save our souls. Today the Virgin stands in the midst of the Church and with choirs of Saints she invisibly prays to God for us. Angels and bishops worship, Apostles and Prophets rejoice together, since for OUR sake she prays to the Pre-Eternal God.